The posterior cruciate ligament is important for stabilizing the knee and preventing it from bending back the wrong way. The most common cause is an impact to the front of the knee which causes the joint to bend back the wrong way. Here we explain the immediate first aid and treatment as well as rehabilitation exercises, strapping and more. Symptoms of a PCL injury typically include pain at the time of injury which, over time, may also be felt in the calf region. There will be swelling, although this may be minimal. The athlete may complain of the instability of the joint, perhaps associated with the feeling of the knee giving way. Pain is reproduced when the posterior cruciate ligament is stressed. 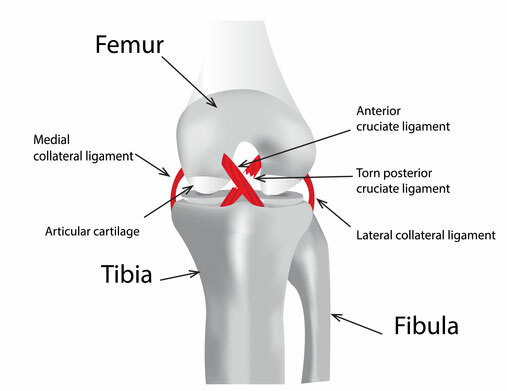 A professional therapist may do a number of knee assessment techniques to help diagnose a posterior cruciate ligament injury including the posterior draw test and Lachman’s test. The posterior drawer test involves pushing the Tibia (shin bone) backwards whilst the knee is bent. A positive result is recorded if the Tibia moves back further than on the uninjured side. The posterior sag test is performed by raising the lower leg to a horizontal position, with the knee bend. The therapist observes if the Tibia drops down, forming a sag or dent at the front of the upper shin. Always compare to the other knee. PCL tears are graded 1 to 3 with level 3 being the most severe. These gradings are classified depending on the amount of backward tibial displacement observed when the knee is bent at 90 degrees. In extreme cases, the ligament may become avulsed, or pulled off the bone completely. The knee is stabilized by four main ligaments. Two at the sides of the knee and two which cross over in the middle front to back. The ligaments at the sides are called the collateral ligaments. Together the medial ligament on the inside and the lateral ligament on the outside prevent sideways movement of the knee joint. The cruciate ligaments which cross over in the middle of the knee are the anterior cruciate ligament which prevents the shin bone popping out forwards and the posterior cruciate ligament prevents the shin bone or tibia moving backward with respect to the thigh bone or femur. This movement is known as a posterior drawer. The posterior cruciate ligament also helps to prevent the tibia from twisting outwards. Injury to the ligament leads to knee instability with the shin bone having a tendency to sag backward when the knee is bent at 90 degrees. 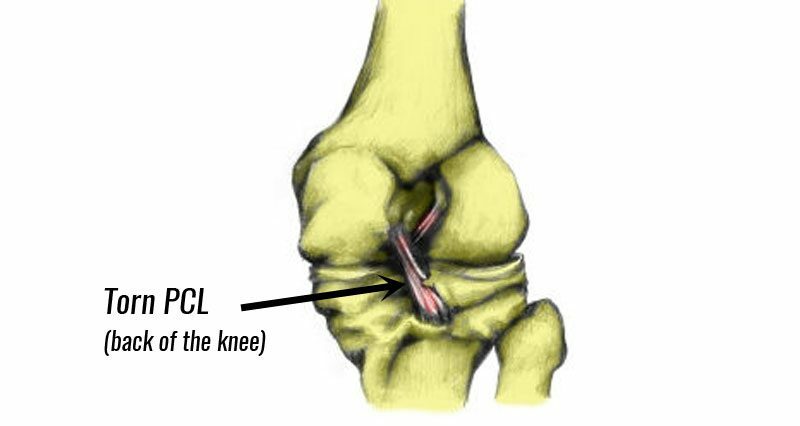 The incidence of injuries of the PCL is less than that of the anterior cruciate ligament. This is mainly due to the greater thickness and strength of the ligament. Nevertheless, the most common way in which the PCL is injured is by direct impact to the front of the tibia itself, usually when the knee is bent. This may occur in a front-on tackle or collision or when falling with the knee bent. The injury is commonly associated with injuries to other structures in the rear compartment of the knee joint such as lateral meniscus tears. In addition, the articular cartilage may also be damaged. Immediately after the knee is injured the principles of PRICE should be applied. Protection, rest, ice, compression and elevation. Ice and compression should be applied as soon as possible after injury for 10 to 15 minutes every hour to help reduce pain and swelling over the acute stage. Cold therapy wraps specifically designed for the knee combine cold therapy and compression. This can be 24 to 48 hours or longer depending on how bad the injury is. Ice should not be applied directly to the skin as it may cause ice burns. Wear a knee support to protect the joint. See a sports injury professional. If the knee is initially painful and swollen it is unlikely that a full examination will be possible. Once the pain and swelling have subsided a sports injury professional should be able to examine and diagnose the injury. A professional will do a full knee assessment and get an accurate diagnosis. They may refer to an MRI scan and/or X-ray to assess the extent of the damage. Once the injury has been correctly diagnosed, 2 modes of treatment may be recommended, conservative treatment or surgery. Conservative treatment is everything that does not include surgery. This is indicated in most posterior cruciate ligament injuries and may consist of ice and heat treatment, electrotherapy e.g. TENS and ultrasound, manual therapy and exercises. Advise on a specific rehabilitative exercise program which may include quadriceps and hamstring strengthening, gait re-education and balance training using wobble boards. A knee support or brace can be used in the early to mid stages. Hinged knee braces will provide the most support for knee ligament injuries. The aim of PCL taping is to provide support for the ligament and prevent the knee hyperextending (bending the wrong way) during healing or to give support and confidence during rehabilitation. Specialist hinged knee braces which restrict the amount of flexion in the knee are the best type of brace as they protect the PCL more. 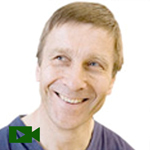 Expert interview: Mr. Richard Villar, leading Orthopaedic Surgeon and former Surgeon to the British Army Special Air Service Regiment, explains posterior cruciate ligament surgery. A lesser proportion of PCL injuries require surgical intervention. However, in more serious cases, in particular, those in which other structures within the knee joint have been injured, surgery may be recommended. Surgery may also be indicated if the conservative management has not aided the stability of the knee sufficiently over a period of time. In general, those who have sustained a PCL injury normally have good recovery rates, with most being able to return to sporting activities at the same level as before the injury. However, full recovery from cruciate ligament damage is highly dependent on the ability to adhere to a strict rehabilitation program. The posterior cruciate ligament is torn less frequently than an ACL injury although it is much more demanding to deal with surgically. Usually, the first step with a PCL rupture is to try conservative treatment, such as physiotherapy and strengthening exercises. If this is unsuccessful, bracing may be attempted before surgery is undertaken. The procedure for a PCL reconstruction is similar to the ACL operation whereby it is an intra-articular operation using a bone-tendon-bone graft to create a new ligament. Recovery from PCL reconstruction surgery is initially quite quick from the surgery itself to getting back on your feet although it is a longer process to get back to sports. Villar recommends a minimum of 6 months and up to a year.